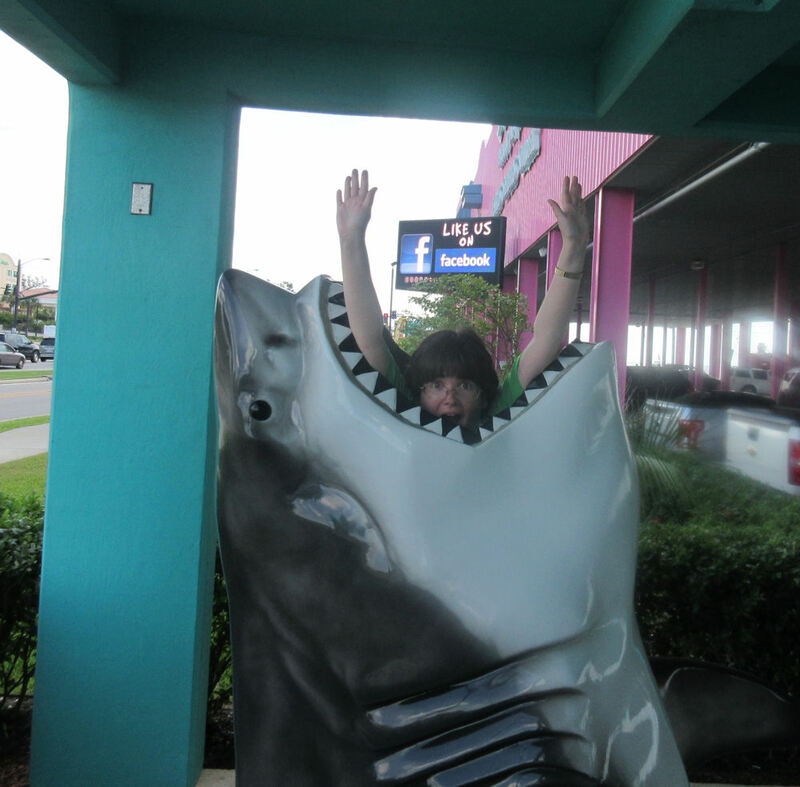 2015 Road Trip Photos #36: Shopping With Sharks « Midlife Crisis Crossover! If I ever got self-deluded enough to pay for a Midlife Crisis Crossover booth at a convention, this would totally be the image on our banner. 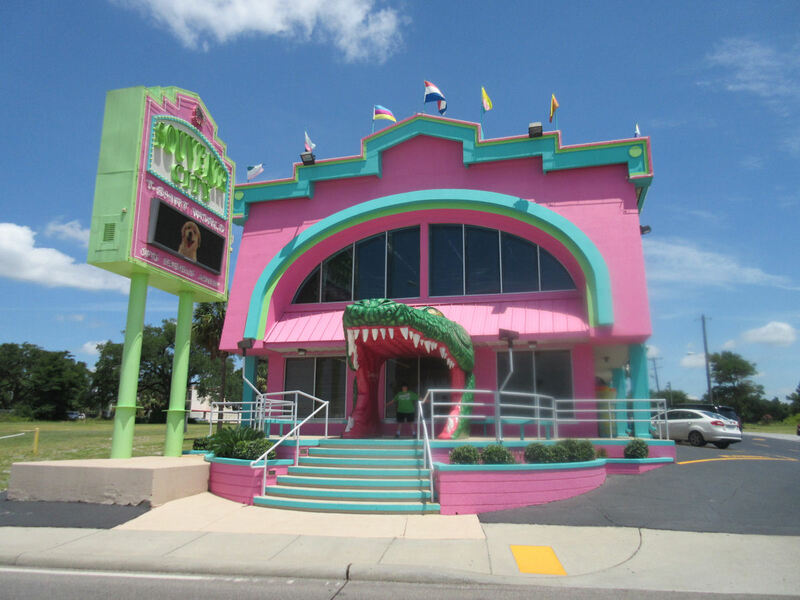 U.S. Route 90 through Biloxi runs near the Gulf of Mexico and features a pair of souvenir shops ready to sell you Mississippi memorabilia, provide all the beach gear you’ll need for your extended near-ocean stay, or just let you hang out with their marine life collections — all of it colorful, most of it inanimate. Anne stands inside the gator-head door for size reference. Or croc-head door. Whichever. 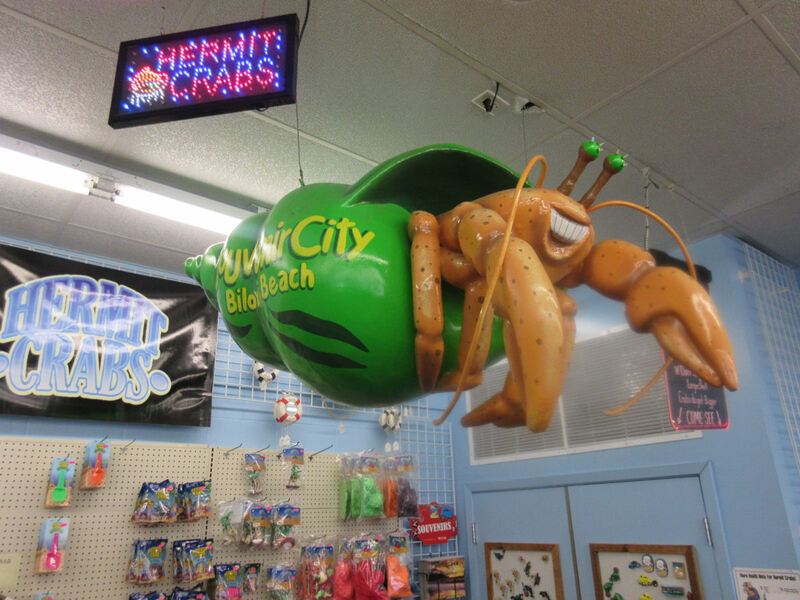 When you’re driving eastward from New Orleans, your first stop is Souvenir City, which chose simple obviousness over oddball creativity in its name…which, well, tells you what you need to know. Flying shark over the side entrance. One wonders if it’s a tricky proposition in Hurricane Katrina country to evoke the specter of Sharknado. Two full floors are stuffed with swimwear, beach toys, merchandise from the various Southern cities and hot spots in the vicinity, and thousands of other potential impulse purchases. Just because you’re indoors doesn’t mean you’re safe from giant seaside mascots. 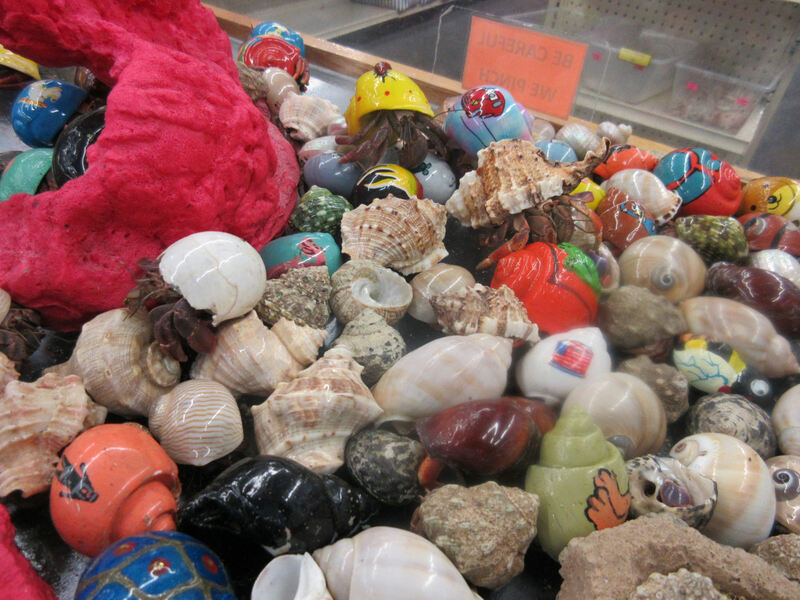 If you brought kids who love animals, Souvenir City has a display case full of live hermit crabs that you can pretend is a free zoo. I wouldn’t recommend petting them, but that’s your call to make as a parent. If you think a sharp pinch will teach them an important life lesson, don’t let me stand in your way. I’m not the one who’ll be lashing out about the pain fifteen years from now on Twitter. Honestly, at first I (somehow) overlooked the gallery of “HERMIT CRABS” signs and the mega-hermit crab dangling overhead, and thought this was a case full of empty shells. It took a few seconds for my eyes to focus and spot signs of life, crawling and floundering and stepping on each other’s heads. Not far down the road, the same company has another location called Sharkheads. Same merchandise, slightly different aesthetic. I’m ready for my Syfy Original Movie death cameo! 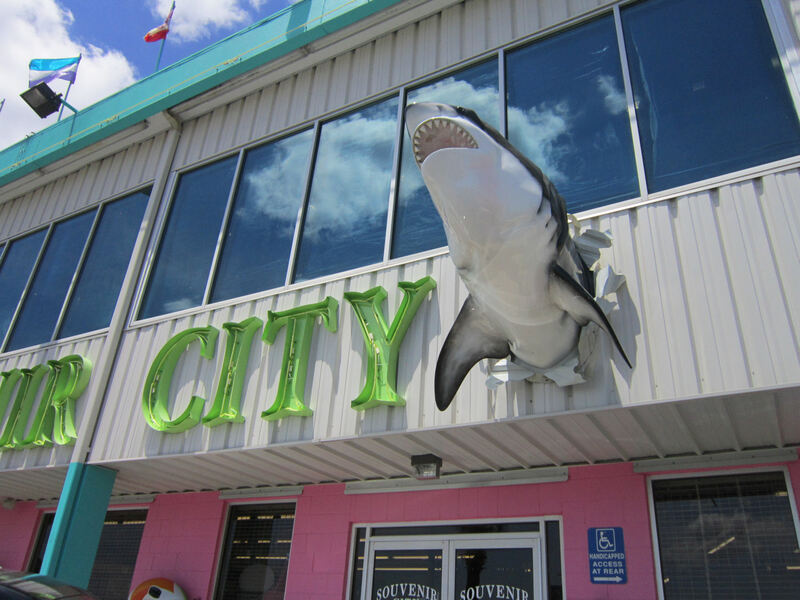 Whereas Souvenir City is on the side of US 90 away from the Gulf, Sharkheads is right next to the beach and, you’ll note, has been rebuilt atop super-sized columns meant to withstand future natural disasters. Should the community be struck again in the decades ahead (may God forbid), there’ll be one less business needing to be salvaged from scratch — maybe even serve as a haven in case of emergencies. 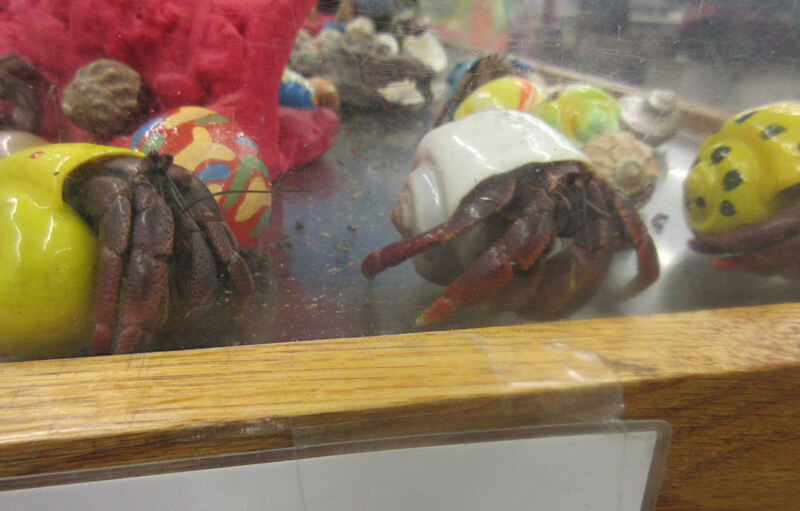 And they have their own hermit crab tank, so that population will live on. 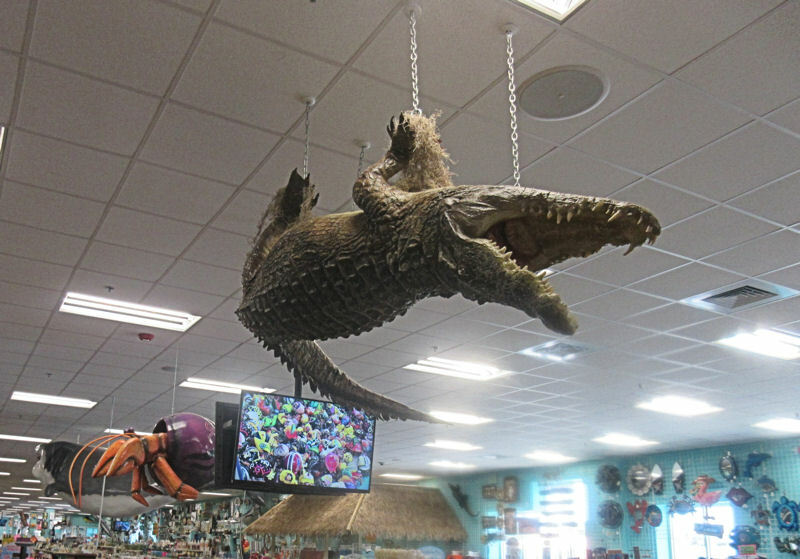 Thankfully this randomly upside-down gator was not suspended above a tank full of tiny pet gators for sale. 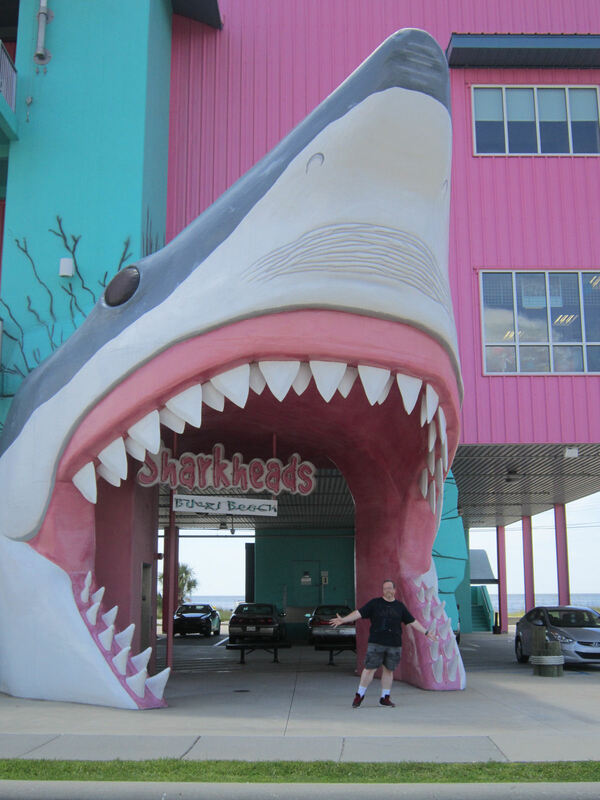 Together Souvenir City and Sharkheads are a positive sign that the southern American coastline is once again open for business, prepared for visitors, willing to cater to your travel needs, and ready for its closeups in your future vacation photos. 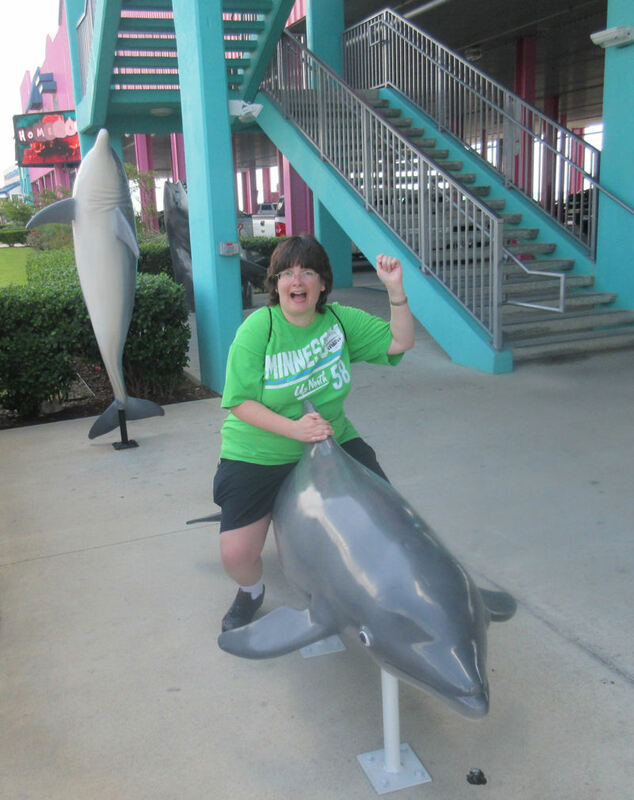 Here’s Anne acting out my pitch for a Sharknado sequel in which a pod of super awesome hero dolphins beat the crap out of all the sharks and save the day. I’ll be waiting to hear from you, Syfy. I’d love to take a souveniery road trip like this one day. I’m sure my kids will hate it! Every minute of it, if they’re like my son. 😀 When he was younger and still coming with us, stops like this killed him with embarrassment. Uhh…that’s a really nice…chandelier they’ve got there. The lights don’t work, but it certainly turns heads. I wonder if they sell them at Kohls.